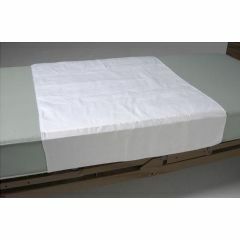 Salk CareFor Deluxe Underpads with Tuck-in Flaps - 32 x 36"
Salk CareFor Deluxe Reusable Underpad with Tuck-in Flaps - 32 x 36"
CareFor Deluxe Reusable Underpad is a reusable quilted bedding protection absorbs and traps liquids.3-layer construction includes stay-dry top layer and antibacterial, anti-fungal finish. Will not slip, ball or shift. Fill is 10 oz. poly/rayon. PVC/polyester back sheet is totally waterproof and provides a non-slip surface. Waterproof binding prevents moisture from wicking over the edge. One underpad per package. Will this fit an extra long twin bed? I have a split king adjustable bed, and I don't know if this will fit. It depends more on the size of the person than the bed.